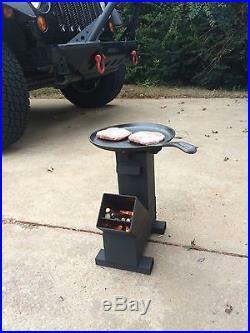 This listing is our same great Gravity Feed Stove but with steel caps. No better way to keep other supplies together in your stove! Thank you for your time and consideration! 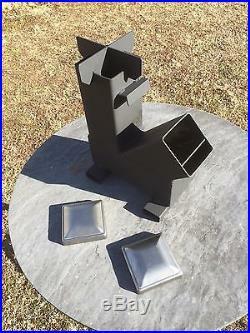 Gravity Feed / Self Feeding Rocket Stove by Outback Fabrications. Great for sportsmen, campers, survivalists, preppers! These produce little to no smoke with dry wood fuel! The cooking temp is controlled by increasing or decreasing the amount of fuel used. Using dry sticks/twigs, scrap lumber, you have all the fuel you need to operate your rocket stove. A few sticks generate enough heat to boil/purify water, brew coffee, cook eggs, bacon, pancakes, etc. About anything you can cook on your kitchen stove top, you can cook on a rocket stove! 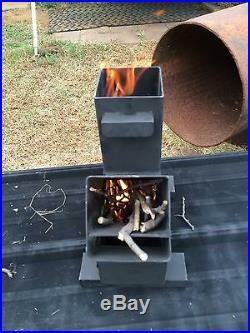 The design of the self feeding or gravity fed rocket stove has been around since the 80’s. This is OUR PATENT PENDING, uninsulated, adaptation of it. An insulated chimney is not required to get the famous “whooshing” sound the rocket stove is named after. When you get the temp up, it makes the sound. Made from new 4 11ga (1/8in). 4 x 11ga stoves accomodate larger amounts of fuel and handle heat better. This handy survival stove is built to last! Larger fuel chamber means longer burn/cook times. LARGER THAN ANY OTHER of this size. See our other listings for our different designs. Welded 1/8th inch internal fuel shelf won’t burn out or warp like expanded metal units will. There’s no sliding shelf to keep up with or get damaged. Cross-braced Grate is designed to last for years. Won’t burn out or diffuse heat like some expanded metal units will. Open grate design allows user to feed from plenum or chimney. These are a very useful thing to have next to your generator this winter, in your camper, RV or for your campsite or “off grid” property! Great for tornado or hurricane areas… Not propane or alcohol. Keep one in your shelter! But you can get yours here! Your new stove will arrive painted flat black with high heat resistant 1200F paint as shown. Units are designed for outdoor use only. 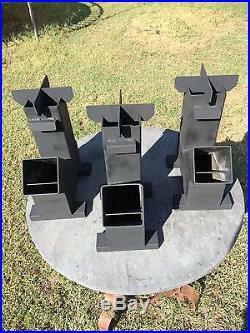 We make lots of custom rocket stoves, smokers, target stands in addition to our welding and fabrication services. Have a custom idea? Please check out our other auctions. Made In America at our Veteran owned shop. By purchasing this item, User agrees to all terms and is responsible for all liabilities in use and code compliance in your area and application. The cost of steel is going up from all sources, get them now while they are at this price!! Thank you for your time and consideration. We are a full service welding and fabrication shop, sometimes we get a bit busy, thank you for your patience. 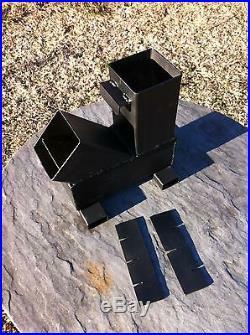 The item “Gravity Feed Rocket Stove with caps by Outback Fabrications” is in sale since Monday, March 26, 2018. This item is in the category “Sporting Goods\Outdoor Sports\Camping & Hiking\Camping Cooking Supplies\Camping Stoves, Ovens & BBQs\Camping Stoves”. The seller is “outback_fabrications” and is located in Harrah, Oklahoma. This item can be shipped to United States. 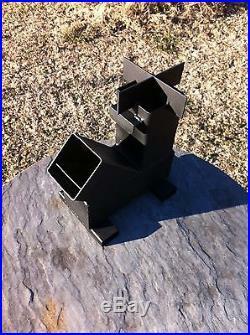 Gravity Feed / Self Feeding Rocket Stove by Outback Fabrications. Great for sportsmen, campers, survivalists, preppers! These produce little to no smoke with dry wood fuel! The cooking temp is controlled by increasing or decreasing the amount of fuel used. Using dry sticks/twigs, scrap lumber, you have all the fuel you need to operate your rocket stove. A few sticks generate enough heat to boil/purify water, brew coffee, cook eggs, bacon, pancakes, etc. About anything you can cook on your kitchen stove top, you can cook on a rocket stove! 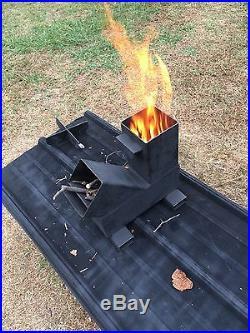 The design of the self feeding or gravity fed rocket stove has been around since the 80’s. This is OUR PATENT PENDING, uninsulated adaptation of it. An insulated chimney is not required to get the famous “whooshing” sound the rocket stove is named after. When you get the temp up, it makes the sound. Made from new 4 11ga (1/8in). 4 x 11ga stoves accomodate larger amounts of fuel and handle heat better. This handy survival stove is built to last! Larger fuel chamber means longer burn/cook times. See our other listings for our different designs. 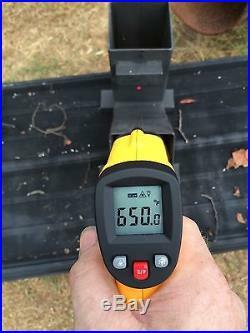 Welded 1/8th inch internal fuel shelf won’t burn out or warp like expanded metal units will. There’s no sliding shelf to keep up with or get damaged. Cross-braced Grate is designed to last for years. Won’t burn out or diffuse heat like some expanded metal units will. Open grate design allows user to feed from plenum or chimney. These are a very useful thing to have next to your generator this winter, in your camper, RV or for your campsite or “off grid” property! Great for tornado or hurricane areas… Not propane or alcohol. Keep one in your shelter! But you can get yours here! Your new stove will arrive painted flat black with high heat resistant 1200F paint as shown. Units are designed for outdoor use only. Please check out our other auctions! Made In America at our Veteran owned shop. By purchasing this item, User agrees to all terms and is responsible for all liabilities in use and code compliance in your area and application. The cost of steel is going up from all sources, get them now while they are at this price!! Thank you for your time and consideration. We are a full service welding and fabrication shop, sometimes we get a bit busy, thank you for your patience. The item “Gravity Feed Rocket Stove by Outback Fabrications” is in sale since Monday, March 26, 2018. This item is in the category “Sporting Goods\Outdoor Sports\Camping & Hiking\Camping Cooking Supplies\Camping Stoves, Ovens & BBQs\Camping Stoves”. The seller is “outback_fabrications” and is located in Harrah, Oklahoma. This item can be shipped to United States. 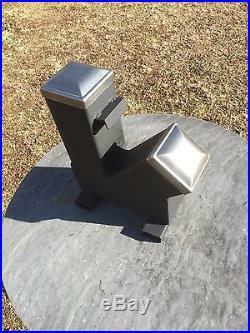 Gravity Feed / Self Feeding Rocket Stove by Outback Fabrications. Great for sportsmen, campers, survivalists, preppers! These produce little to no smoke with dry wood fuel! The cooking temp is controlled by increasing or decreasing the amount of fuel used. Using dry sticks/twigs, scrap lumber, you have all the fuel you need to operate your rocket stove. A few sticks generate enough heat to boil/purify water, brew coffee, cook eggs, bacon, pancakes, etc. About anything you can cook on your kitchen stove top, you can cook on a rocket stove! 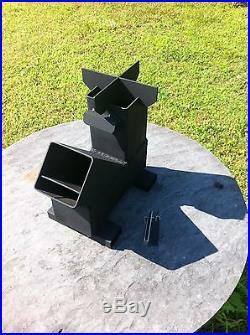 The design of the self feeding or gravity fed rocket stove has been around since the 80’s. This is OUR PATENT PENDING, uninsulated adaptation of it. An insulated chimney is not required to get the famous “whooshing” sound the rocket stove is named after. When you get the temp up, it makes the sound. Made from new 4 11ga (1/8in). 4 x 11ga stoves accomodate larger amounts of fuel and handle heat better. This handy survival stove is built to last! Larger fuel chamber means longer burn/cook times. See our other listings for our different designs. Welded 1/8th inch internal fuel shelf won’t burn out or warp like expanded metal units will. There’s no sliding shelf to keep up with or get damaged. Cross-braced Grate is designed to last for years. Won’t burn out or diffuse heat like some expanded metal units will. Open grate design allows user to feed from plenum or chimney. These are a very useful thing to have next to your generator this winter, in your camper, RV or for your campsite or “off grid” property! Great for tornado or hurricane areas… Not propane or alcohol. Keep one in your shelter! But you can get yours here! Your new stove will arrive painted flat black with high heat resistant 1200F paint as shown. Units are designed for outdoor use only. Please check out our other auctions! Made In America at our Veteran owned shop. By purchasing this item, User agrees to all terms and is responsible for all liabilities in use and code compliance in your area and application. The cost of steel is going up from all sources, get them now while they are at this price!! Thank you for your time and consideration. We are a full service welding and fabrication shop, sometimes we get a bit busy, thank you for your patience. The item “Gravity Feed Rocket Stove by Outback Fabrications” is in sale since Friday, February 23, 2018. This item is in the category “Sporting Goods\Outdoor Sports\Camping & Hiking\Camping Cooking Supplies\Camping Stoves, Ovens & BBQs\Camping Stoves”. The seller is “outback_fabrications” and is located in Harrah, Oklahoma. This item can be shipped to United States.